Mourning doves can fly as fast as 40 miles per hour. They are game birds and allowed to be hunted in some states such as Georgia. They multiply quickly as mourning doves mate throughout the year. They adapted easily to the changes in agriculture, making them one of the most commonly seen birds in residential areas. As pets, mourning doves are independent and don't require much contact. 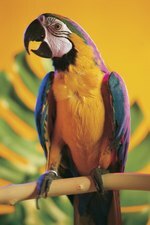 In caring for these birds, they need a large, clean area, warm temperatures, and a good diet for a healthy life. Purchase an aviary for the mourning doves. Aviaries are large cages that are also known as flight cages, allowing the bird space to fly. Place the aviary where there is no extreme temperature fluctuations. Keep plants near the cage to help the doves feel they are in a natural environment. Place three to four perches at different levels inside the cage for the birds to sit upon along with two water and food bowls each. Since mourning doves are ground feeders, place the food and water bowls on the bottom of cage. The food and water bowls need to be checked three to four times a day to make sure that they are not spilled or have feces in them. Feed the birds daily. Mourning doves eat mostly seeds and grain. Feed finch food daily and add thinly sliced fruits and vegetables, including carrots and apples, in their food bowl two to three times a week. Provide the mourning doves with a nesting box. If you have a male and female dove together, a nesting box is necessary as they can mate up to six times a year. The box will need to be at least 7 by 8 inches with some leaves and twigs inside. Mourning doves have clutches of up to two eggs, and both male and female take turns incubating the eggs. Have a professional clip the mourning doves' wings if you are not certain on how to do it. It is important to have the wings clipped if you plan to keep them as pets to prevent the mourning doves from flying high and fast in case they do get out of their cage.